Why is GeoGuessr not working? Sometimes it doesn't work, sometimes it does work albeit really slowly. Hi there. We've done a few tweaks behind the scenes, is the experience smoother for you now? BTW, who else here has had this problem? OK, so it's not working only in my one laptop. In my other laptop, it does work. But I don't even use the other laptop. Like, I can't even view results anymore even though I could in the past despite GeoGuessr not working in general. Ok, hmm I'm not sure what might cause this. Double check that your OS/browser is up to date. This doesn't seem to be an issue a lot of people are having so I'm not sure what it might be..
Did you check the console for errors? In chrome right click in the white bottom bar and click 'inspect' than choose 'Console' tab, reload the page with this tab open. Hopefully it'll give us something to work with..
Hi. I like this game and it makes fun. But sometimes i have a black display instead of a streetview view. How can it be and what can i do? What maps are you experiencing this on? Google updates their street view data frequently and sometimes locations that have previously existed is deleted (which results in the black screens). What browser are you using? We've previously had some reports that some browser extensions (Avira antivirus for example) creates problems with Google streetview (which GeoGuessr uses). Could you please try to start a new browser window in incognito mode, which automatically disables all extensions, and see if there is any difference? in incognito mode the problem is still there. I already tried to uninstal Chrom and reset settings. also i haven't any browser extensions instaled. All i see when i play is black. Just black. What is wrong? Can you fix it please. Does it work on any operating system? I can't get it to work on Windows 7. It appears that you can get to some of the actual text and link content if you scroll down far enough, but css is definitely not loading and perhaps the script is broken as well. I know that cloudfront is an Amazon product. Is it possible that they've changed the css address? Sorry about this! As you suspected we've started using cloudfront to improve performance but we've had some problems initially. Are you still experiencing these issues? Definitely still problems. The display is HUGE, like an icon takes up the entire width of the page and you have to scroll forever to get to actual content. 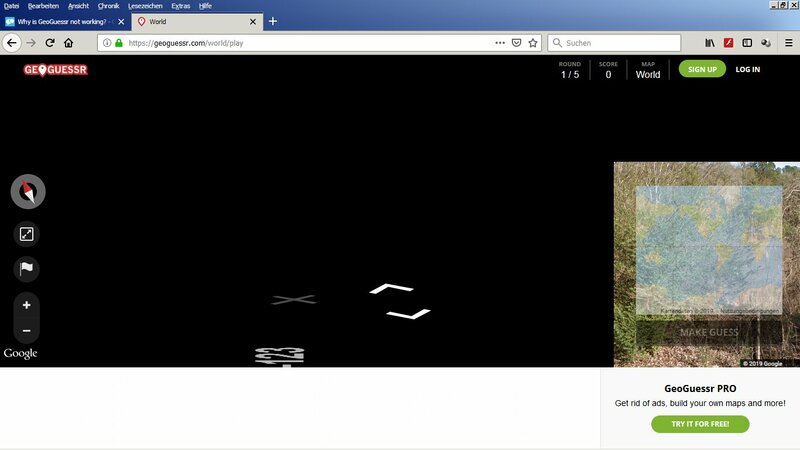 I'm attaching a screenshot (my browser is not zoomed in), and https://d2j9euzne75qai.cloudfront.net/css/social.3f5b16b3.css is still not loading. Thanks for looking into it. LOVE Geoguessr! I'm still having issues and I've tried Chrome and IE. The screen is mostly black. It's fixed this morning! Yay! Thank you!! @jbartlet827: Great to hear that it works! I LOVE to play your game but have not been able to play for the last 3 or 4 months. I have tried different browsers. I have tried playing incognito. In Google, the screen is dark except for a 2 inch by 2 inch partial map in the lower right hand corner. In Firefox i have a full street view but there is no street name showing. Please help me so i can start playing again. Is there a particular browser that works better than others? Is there a fix for this? Have you heard other complaints of this nature? Sorry to hear that! We've heard of a few very similar problems before (especially the Chrome-issue you're referring to). You mentioned that you've tried different browser but have you tried to disable hardware acceleration, for example in Chrome (there are a lot of how-to-guides if you google it), this seems to have solved this problem for other users. Your suggestion about turning off the hardware acceleration worked. I can see the street view on the entire screen now which is awesome, thanks! However, now i cannot see the street/highway name displayed on the screen, where in the past it was available to see......any suggestions? Great to hear that it worked! Regarding the street names, do you mean in the panorama or in the guessing map? We've had street names in the panorama from time to time but we ultimately decided to remove them since we felt that they took away a lot of the "mystery" and fun from the game. oh, i meant on the big game screen (which i guess is the 'panorama'). guess that explains it but makes the game MUCH more difficult. thanks! I use many different computers at work and it only works properly on the first one I used. Whilst it can be fun if you can get the Hoover Dam from a small bit of picture 1.5" x 1", it gets a bit hard when you can only see asphalt. I see, that's weird we're trying to figure out what it can be but we haven't been able to recreate it..
Hi, I use Safari on a MacBook. I used to (a few years ago) play GeoGuessr fine, but I revisited it this weekend and when i click on the play option , all I see is some of the Google maps icons and the 'Make a Guess' button, the rest is black. What could be the issue? Does it use one of those game 'plug-ins', I can't remember whet they are called now. Do I need to update my Safari or is it something else? Geoguessr just gives me a black screen. Cleared my cache. Disabled hardware acceleration. Thoughts? Your suggestion about turning off the hardware acceleration worked. I can see the street view on the entire screen now which is awesome, Recently I bought an iPhone and it gives better response only one thing that gives me the error that is application installation regarding this I contact to Apple Application Support team. I need your help. Everytime I start a new game it says that google maps wasn't properly loaded and that I therefore can't play the game. How do I fix this? Same problem here. Google maps is not loaded, every time I start a game. I played several games 5-6 days ago without problems. I'm on an iMac, in Chrome, latest version. It's not you. It's down right now for everybody. Hi, sorry about that! It's not on your guys side it's our connection to the google maps api, we've filed a support case and been in contact with them, hopefully it will be back up again soon! That has been happening to me as well. I have tried on different computers and it is saying the same thing. Mikael - There's quite a bit of banter on Reddit that it might be related to the cost of Google's API, and people would like to know, if that's the case, is there a way, in addition to Pro, accounts that people can contribute to the cause? It seems to work again, at least for me. Anyone else who can play again ? Hi guys, It should finally be back up again! Sorry for the inconvenience. We'll look over our routines so this won't happen again. @Judy - Thanks for the info, I'll look into it and get back to you! It works now, thank you! I'm happy! I can play again. @ geoguessr. Great work! Thanks for a wonderful game and making it work again! i too have been following this thread since a long time, but i'm still having this problem. I use a laptop with Windows 7, Firefox and Chrome, have cleared the cache, disabled hardware acceleration, tried incognito mode, but to no avail. Same Windows 7, Firefox and Chrome on a desktop computer works like a charm without any further ado, but not the laptop. It would be really nice, if someone could continue looking into this. Please make this game available to us again. Pretty crap since they stopped you using ad blockers. Often the picture does not load. Hideous intrusive ads all over the place. Lost me as a user. I think I'm having the same problems as the loads of people above. The thing is though, If I try to play it on a mobile browser (on iPhone, Samsung Phone, iPad, etc. ), it works. I'm kinda confused why it works on mobile but not on a desktop. Is something else going on? Hey Geoguessr 👋, we've been playing challenges with work colleagues, but quite a few people in the office (I'm guessing on the same Network) intermittently get the black tiles. Is there anything I can say to those affected?